I think cooking is a scary prospect for a lot of people because it seems so complicated, when 99% of it is really simple. That said, I think it could be simpler. 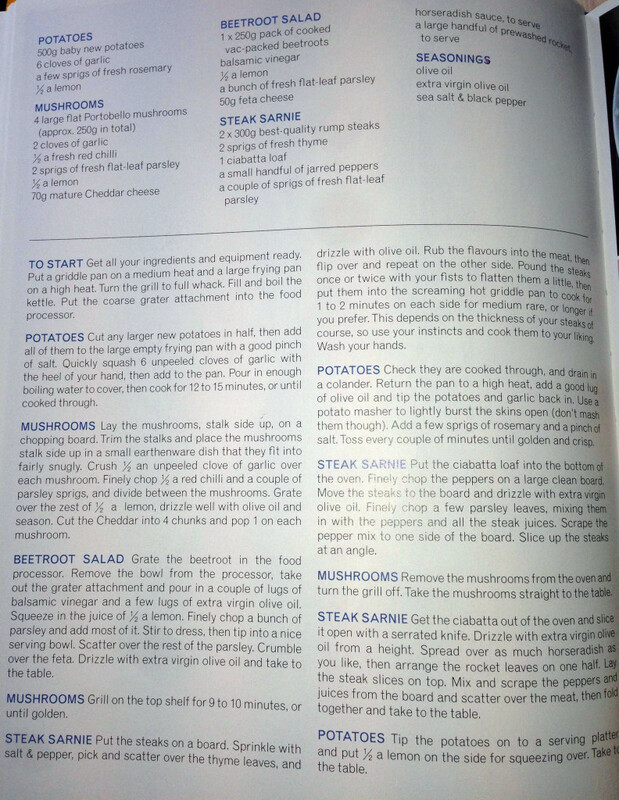 Recipes are often a nightmare to decipher, especially as you refer back to them during the cooking. They’re published in books that won’t stay open on the counter top, in a tiny font you can’t quickly glance at. I would read through a recipe a few times and mentally plot when I was going to do different things based on how long I thought everything would take – but that seldom worked out as I’d forget under the pressure. I picked up one of the endless notepads I have lying around my office and started writing out my own recipes, with rough timings and steps that I feel make more sense. Perfect for me, but not so much for the problem on the whole. As a designer with time on his hands and a problem to solve, I decided to try and make my recipes as silky smooth and simple to follow as possible. No tiny font, no huge paragraphs. Simple steps. It should be easy to pick out ingredients in a sentence. Sometimes I can’t find everything a recipe asks for. Can I make a Thai Green curry without bamboo shoots? Sure, it’ll taste similar but probably needs bulking up a bit. Maybe add some chopped bell pepper or baby corn. You should know where in a recipe you are. You should be aware of why you’re doing what you’re doing when you’re doing it. You pre-heat the oven before you do anything because otherwise you’d be waiting for the oven to warm up after preparing the ingredients. If you’re reading a recipe, chances are you haven’t cooked the meal before. If you’re slow at chopping, maybe prepare everything in advance because the stir-fry ingredients come together quickly once you begin. If you’re too slow, you’ll over-cook the pork. What can I do with leftovers? Make something else? Freeze them? Here are a couple of examples of recipe books in my kitchen. We’ve got about 10, but I’ve tried to pick ones that highlight pros/cons of current books. I’ve also included a common web recipe. This is a great little cook book. There’s lots of really quick recipes, so they don’t need much explaining – I can’t help but feel that the layout could’ve been done better. Slater gets a pass for not listing how difficult it is to prepare, because the whole book is full of pretty simple recipes. He also gets a pass for not listing how long it takes as all the recipes are supposed to be quick to prepare. Tells me how many people it’ll serve, but it’s buried at the bottom. How useful! The bold is a good idea, but I think the font choice & fact that lots of bolded text is used next to eachother negates any readability that may have been gained. I think bolding the quantity is an error, as it’s much easier to scan read a single bolded word vs a sentence. This is my favourite cook book. 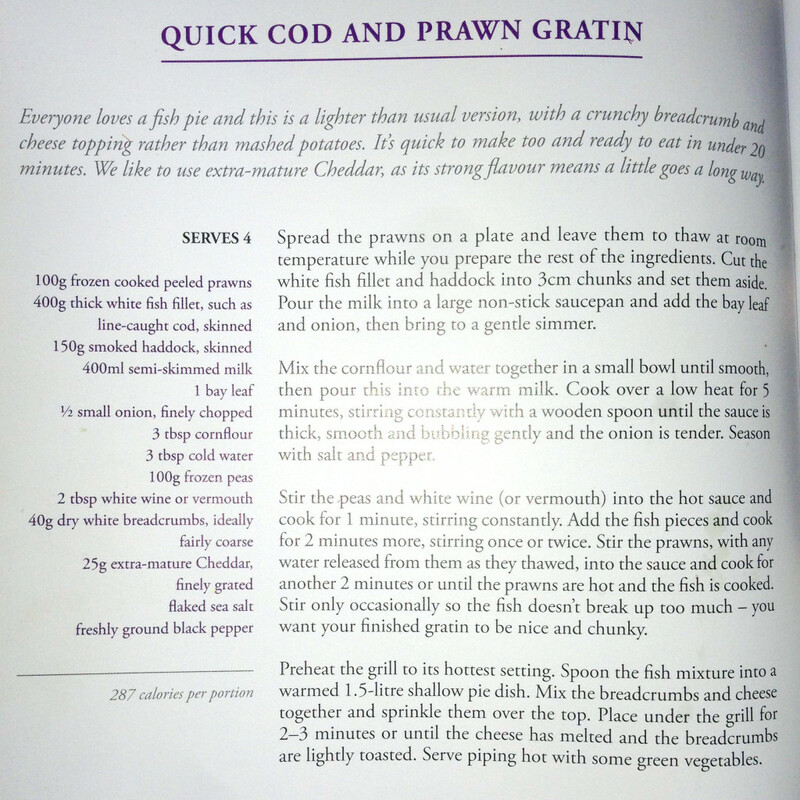 Everything in here is delicious and especially this recipe for cod & prawn gratin. Though the steps are too long, they are good for giving you context & not overloading you with stuff to do. Can be quite difficult to find where you are as each step is 5+ lines. This is my favourite layout by far. Jamie makes it really easy to pick out what step you’re working on and allows you to break out a specific part from the overall recipe (say for example you just wanted to prepare the potatoes) with ease. Breaks down ingredients really well. He even lists ingredients multiple times for each different combination. Pacing and context are good as the steps are properly intertwined & quite easy to decipher. I really love the ingredients layout, but I would like an overall ingredients total too so I don’t have to add them up myself and potentially make a mistake by buying too little of something. Some steps are too long, but I can forgive this as they’re well written and put into context by the other steps. This web layout is always going to be better than print – more colour, more photos, unlimited space. It’ll work well on any device – chances are you don’t have a PC in your kitchen but you’re likely to have an iPad or smartphone. I like the ingredients layout. Easy to distinguish between ingredients where the text wraps to a new line, unlike The Hairy Bikers where it can be a little confusing. Prep time, cooking time & servings are right there in the header. Nutritional information is great. Not sure how accurate it is though? Freezable is a cool (pardon the pun) addition. What can you do with leftovers? Freeze them. When do I start the rice? Difficulty is listed as “moderately easy”. I don’t like this – it’s a bit vague. Easy compared to what? Chicken galantine or microwaving baked beans? Consider that Good Food is written by a bunch of different people and user submissions. Moderately easy for whom? Below I explore some existing methods that I might like to integrate into mine. 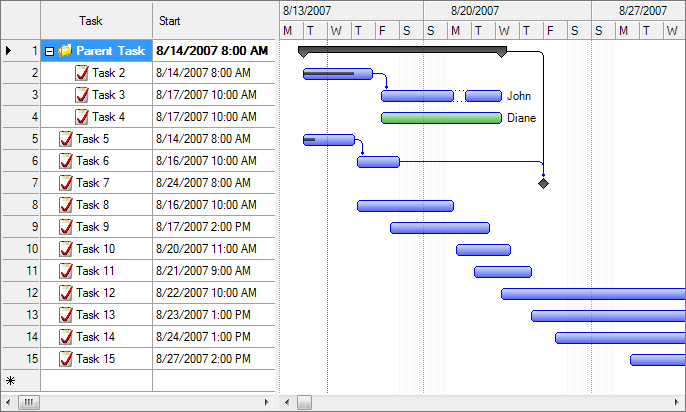 I learned about Gantt charts during GCSE Technology class – maybe school did teach me something after all! A Gantt chat plots time along the x axis and tasks along the y axis. Each task gets a period of time during which you expect it to be completed. Multiple tasks can occupy the same timeframe, because multiple things can be done at once. Casey Neistat uses a modified Gantt chart in this video where he’s preparing Thanksgiving Dinner. He takes planning to a whole new level, with his “timing triangle of success” taking into account oven space, burner space & ability to multi-task in order to prepare all the food with optimum efficiency. Casey is preparing multiple different recipes, so it doesn’t really apply to us – but it’s still awesome. I’m inspired. 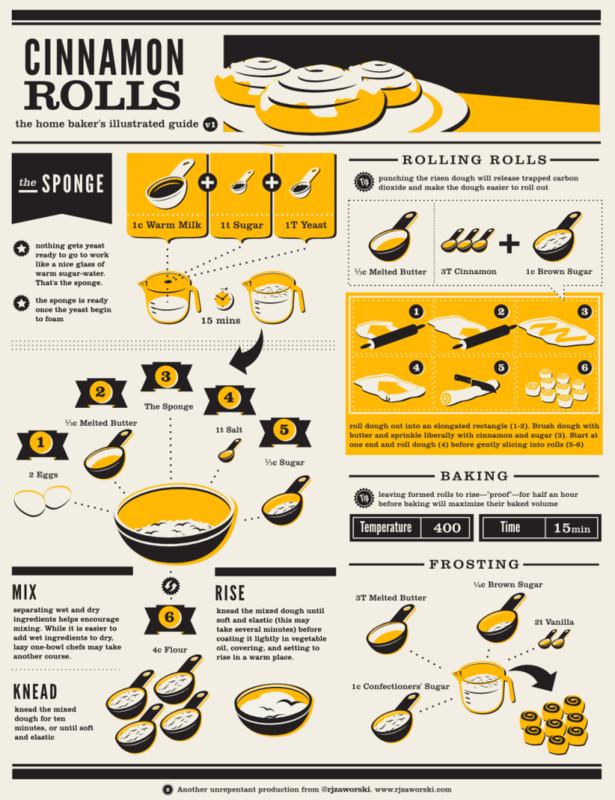 There are a bunch of really cool infographics out there that do a great job of explaining a recipe. However they’re not very repeatable and a lot of work goes into them. 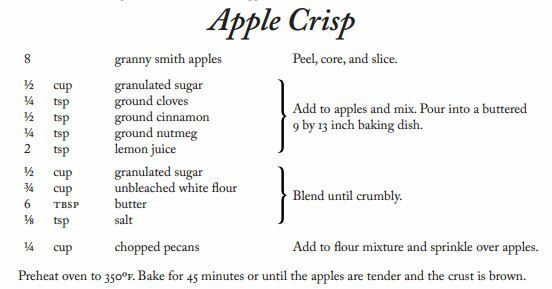 Each recipe would need different artwork, and more distruptively a new layout – a reader shouldn’t have to get used to a new layout every time they try a new recipe. I really like how ingredients surround a container and make it obvious what’s happening. The visual nature of the infographic means you can jump back to it and find your place really easily. A little confusing to follow. Would be good if the dotted lines drew your eyes from section to section also. Expensive and time consuming to produce, not everybody could produce one. Doesn’t repeat well, new layout, colour scheme and artwork for each recipe. RecipeDesignWizard is a plugin for Adobe Illustrator that allows you to create this layout for your recipes. Quantity, metric and ingredient are slightly separated and easier to scan. I like that each “step” seems like a checklist. Sugar check > next line > cloves check > so on & so on. My initial scribbles in a notepad. They’re super condensed because for the most part, I just need roughly reminding, vs explaining the whole recipe. You can begin to see the makings of my timing chart however. Refining the idea now that I’ve decided to actually work on it/have done some research/know my goals. I’ve decided to cut the process into 3 basic timelines; Prep, Main and Sides. I think these best represent most recipes. I had a line to draw the eye for each timeline and various timings. I think it’s a bit confusing, but as a means to an end in terms of refining the idea, I think it’s worth showing you. 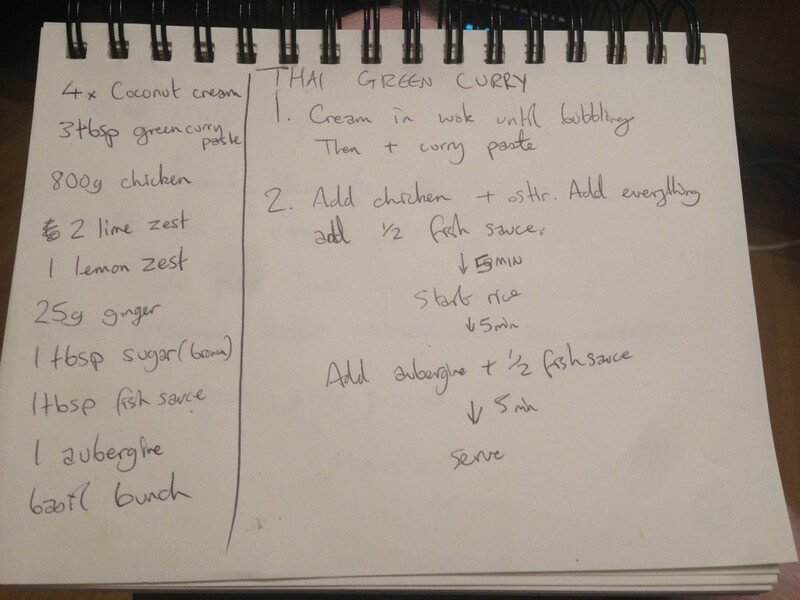 I picked Thai Green Curry because it’s my favourite thing to cook. 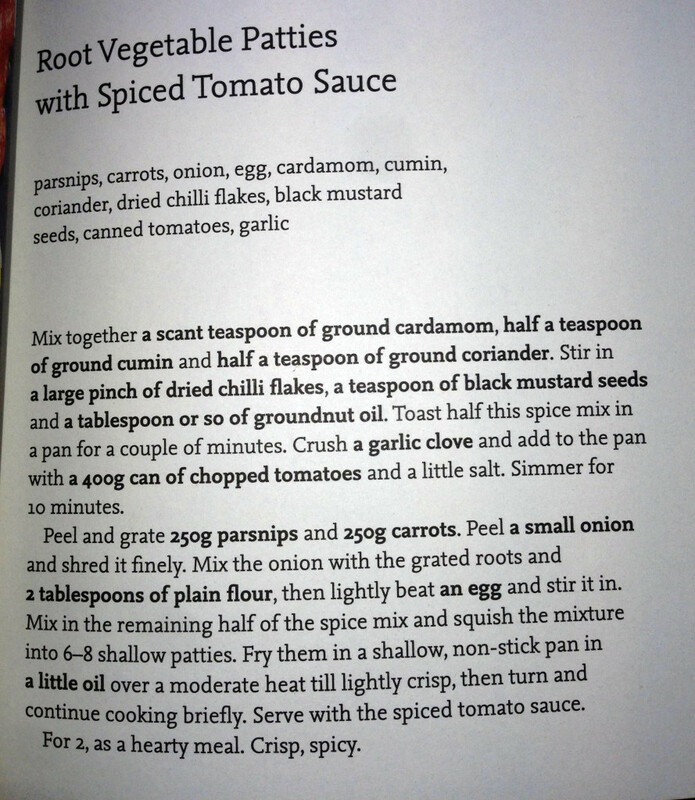 I make the paste from scratch, but I’ve not included that in this recipe because it basically amounts to “put all this stuff in a blender”. Time & serving info is right there in the header. Added an image that I found here (thanks TastingMenu.com) because after all, a recipe is supposed to capture your imagination. 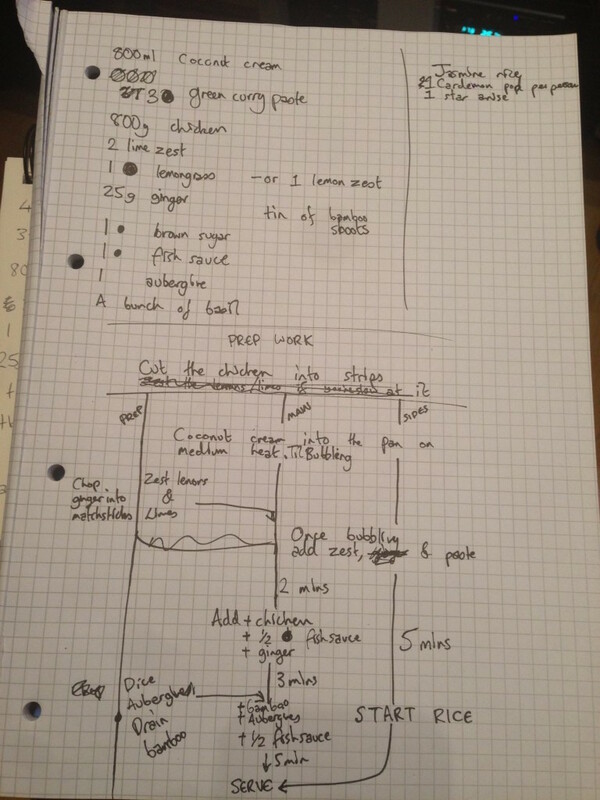 It’s easy to get an estimation of how difficult the recipe will be by taking a quick look at the steps. It could be argued that this is true for all the recipes, but I think these instructions have a certain glanceability about them. I decided on using different colours to help differentiate what’s happening in what column. Note continuity from ingredients to instructions with regard to the Sides. That way, if the user making the recipe is going to use microwave rice (heathens) for example, they know what to disregard when purchasing ingredients. I tried to design it in a way that would allow it to be split into 2 sides of an A4 piece of paper. I could split the ingredients & instructions, print and laminate it and leave it in my kitchen cupboard. Also, an iPad aspect ratio is similar to an A4 piece of paper so chances are the different sections would fit on it properly. I didn’t make a complex layout, there are 3 columns. This is something an app or website could make it easy for a user to replicate (unlike an infographic style recipe). 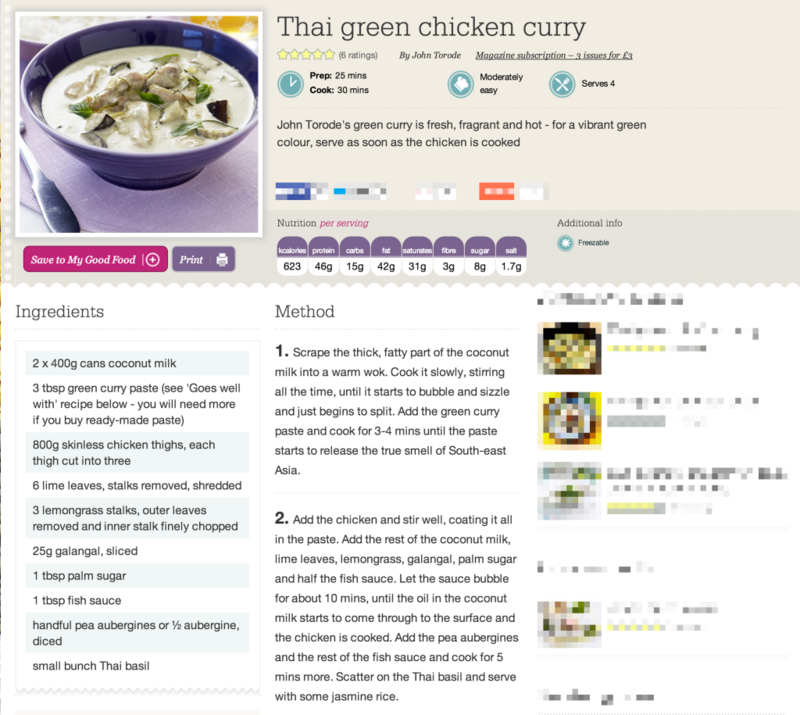 I gave ingredients a colour to allow readers to differentiate between main recipe ingredients & side dishes more easily. I created a shorthand for Tablespoon and Teaspoon, and assigned “cup” (a common measurement) an icon. I did this to establish it as a shorthand so I could use it in the instructions, where I’m trying to be as concise as possible, too. I separated the the name of the ingredient from the amount required similarly to the RecipeDesignWizard. Took a leaf from Jamie Olivers book in giving each step a header of the ingredients being used. I dropped the lines for each section from my initial design, as when I mocked it up properly they were far too confusing. Each step is written sequentially, as if each line were part of a checklist. Common kitchen tasks are included – prepping chicken in advance so you have plenty of time to clean it up & not be potentially spreading raw chicken around your kitchen rushing to do other things. I added short tips and some explanations. I added wait blocks so people know that they’re going to have nothing to do with the main, and should do whatever needs doing with Prep or Sides. What to do with leftovers is written at the bottom, post serving.